Productive, resilient and easy to grow, snap beans belong on every veggie gardener’s planting list. There are dozens of available varieties and many ways to grow beans, but here I want to cut to the chase and concentrate on growing gourmet green beans that are better than what you can buy. I’ve grown dozens of beans in decades of gardening, and at this point I confess to a certain snobbishness regarding bean varieties. 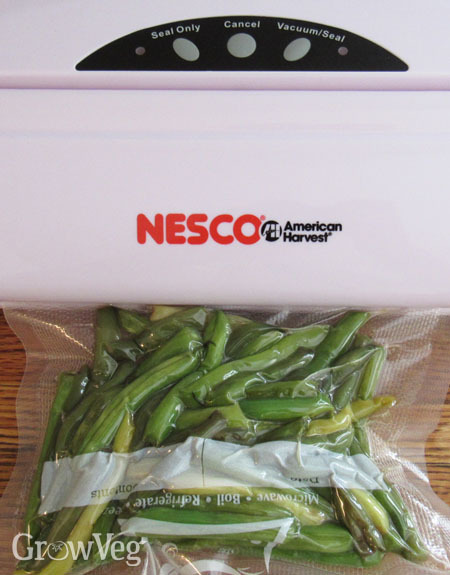 I want crisp, stringless snap beans that are so sweet and flavorful that they beg to be eaten raw, but end up in a braising pan, freezer bag or pickling jar. Combining full flavor with tender texture, the culinary stars of the green bean world are filet beans or haricot verts, which are often called French beans in Europe. The slender, rounded pods in may be green, yellow or purple, depending on variety. Exemplary varieties include ‘Maxibel’ bush and ‘Emerite’ pole. Last year I grew petite, purple-podded ‘Velour’, which overcame bad weather and made an excellent crop for the table and the freezer. Like other purple-podded snap beans, the purple color of ‘Velour’ changes to green when the beans are blanched or cooked. But it takes a lot of delicate French filet beans to fill a basket, so most of my plantings are of high-quality regular snap beans, which bear bigger pods that are long, straight, and stringless. I love the ‘Amethyst’ variety because the purple flowers are so pretty, but my favorite strategy is to grow a tri-color blend of varieties that bear green, purple and yellow pods. Many seed companies offer mixed packets, and you can separate the seeds by color if you want the varieties in different rows. Most green snap beans have white seeds, the seeds of purple beans are tan, and most (but not all) yellow snap beans have black seeds. Finally, you will need to choose between bush (dwarf) and vining growth habit. There is no question that long-vined pole beans produce more food per square foot, and it’s fun watch the vigorous vines scramble over a hand-made teepee or trellis. On the down side, pole beans are often preferred by Japanese beetles because they grow at flight level and make convenient gathering spots. When I grow pole beans, I must collect Japanese beetles daily in a bowl of soapy water, and cover the plants with tulle (wedding net) at night to prevent browsing by deer. Both tasks are easier with bush beans, which grow quickly and vacate their space in time to grow fall vegetables in the same spot. I like to make multiple small sowings of different bush beans so there are always young plants coming along, each with their special talents. A bean gardener must take precautions to prevent boredom. When grown in a fertile, sunny spot, beans make rapid growth and quickly dominate their space, which makes them easy to keep weeded. Plants often start blossoming after only six weeks or so, and fast-maturing bush varieties mature in less than 60 days.